Global, multidisciplinary cooperation has led to a significant advance in neuroscience – a way to guide growth in neurons – that ultimately could have big implications for nerve disorders. The human brain’s billions of neurons make countless connections every day, collaborating to help us eat, dress, read, exercise, avoid danger and more. It’s a big job, but by working together, they get it done. The human research teams who study them have a daunting job – and, like the neurons themselves, they have to work together to do it. One multidisciplinary, multi-institution, multinational project recently found a way to direct nerve-fiber growth by using laser-driven spinning microparticles. The breakthrough could someday lead to chip-grown neuronal networks and even advanced treatments for injuries to the brain or spinal cord. It started with an idea that neurons could show responses to physical cues such as fluid flow, not just chemical cues. As neurons grow and develop in a fetus – a process called neurogenesis – the flow of spinal fluid can guide neurons to their destinations, said Samarendra Mohanty, now an assistant professor of physics at the University of Texas at Arlington. As a postdoctoral fellow working in Michael Berns’ lab at the Beckman Laser Institute at the University of California, Irvine, Mohanty observed that a spinning calcite microparticle could direct neuron growth; the particle’s rotation creates a microfluidic flow, causing a shearing effect, and guiding the neuron to turn left or right. Two spinning beads with a nerve fiber’s growth cone growing between them. The beads generate a weak microfluidic shear in the direction that the cell is migrating. The shear is somehow causing the growth cone to grow in between both of the spinning beads, like a funnel, according to Michael Berns of the University of California, Irvine. Courtesy of Tao Wu and Berns, Beckman Laser Institute. The UC Irvine researchers, in collaboration with professor Halina Rubinsztein-Dunlop of the University of Queensland in Brisbane, Australia, switched from the calcite to more controllable and more uniform 8-µm-diameter vaterite particles, which were placed near axonal growth cones – the tips of neurons where connections are made with other neurons or cells. Because of the circular polarization of the laser beam, the birefringent particle rotates and creates the flow. The paper also noted that the effect of shear on neuron growth may even apply to other forms of cell growth. 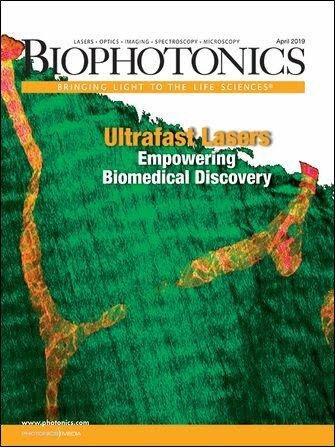 The authors of the Nature Photonics paper included lead author Tao Wu, a current postdoc in Berns’ lab, who did the cell experiments described in the paper; Mohanty, who did the first experiments using the calcite particles demonstrating the effect; neuroscientists Ronald Meyer and Jill Miotke from UC Irvine; and collaborators Rubinsztein-Dunlop and Timo Nieminen at the University of Queensland’s Quantum Science Laboratory, who developed the physical model described in the paper and who were the group that produced and rotated vaterite particles in optical tweezers by transfer of spin angular momentum of light. The study was supported by the US Air Force Office of Scientific Research, the Beckman Laser Institute Foundation and the Australian Research Council. The implications of the research for treatment of brain and spinal cord injuries may be stimulating. “It will definitely be useful for fabrication of in vitro neuronal circuits and [interfacing with a] silicon-based stimulation and detection device,” Mohanty said. Such a chip might be implanted to connect injured nerves, possibly regenerating or restoring certain functions. But we aren’t there yet. It will take years for the nerve-growth discovery to affect human lives directly, Berns cautioned. “This is a tool/method to understand, and based on future studies, new ways to approach the treatment of brain and spinal cord injury may be developed. Until that is accomplished, the work will spawn further studies – as any breakthrough research will do. Mohanty is working on a method that allows long-range optical guidance of neurons without any additional external objects. “Flow can be generated by any means,” Mohanty said. He noted that it would be easier to use a microfluidic tube for work within the human body. “We are trying microfluidic flow in channels to further this idea. Laser trapping in vivo and rotating beads is a little unrealistic, though our lab has developed a method to trap and rotate beads fiber optically. The Beckman Laser Institute in Irvine, Calif. – like all research institutions – strives to bring ideas to life. Its leaders encourage collaboration as an essential part of advancing scientific and human interests. One of their main goals is to translate technology from bench to bedside, according to Dr. Bruce Tromberg, BLI’s director. One of the clinic rooms at the Beckman Laser Institute and Medical Clinic at the University of California, Irvine. The institute exemplifies the spirit of collaboration. These diverse teams pursue fundamental research and technology development in a wide range of fields, especially biology and medicine, from cancer to brain injury to wound healing. “Any good research institution has people who are visionaries,” said George Peavy, BLI’s veterinary director. He’s a big proponent of multidisciplinary collaboration, within a lab and around the world. “Everybody here works really well together. They know what they know and what they don’t know, too. “Collaboration allows us to do what we do,” says George Peavy, the Beckman Laser Institute’s veterinary director. Photos by Laura S. Marshall. The Military Photomedicine Program is one such effort. As part of that project, researchers including teams from BLI, Stanford University and Harvard University are working to develop new technologies for battlefield medicine. One device at UCI is a laser scanner to detect hemorrhagic shock “before it’s too late,” Peavy said. He added that the same scanner ultimately could be used for breast imaging, brain perfusion assessment (especially in anesthetized patients) and hydration monitoring, among other applications. Developing prototypes and improving instrumentation in advance of commercialization are big opportunities for small companies, Tromberg said. “This is risk abatement. Big companies want to acquire low-risk smaller companies, but they don’t like to develop the technology themselves. A doubly refracting mineral used to produce polarizing prisms. It is uniaxial negative and in the trigonal division of the hexagonal system of crystals. Its indices are e = 1.486, w = 1.658; its hardness is 3 Mohs; and its specific gravity is 2.711.